The Crown Goa is a Goan Boutique Hotel nestled on a historic hillock in the centre of Panjim. Besides being located in one of the world’s most popular holiday destinations, The Crown Goa has the most breathtaking views of the River Mandovi. 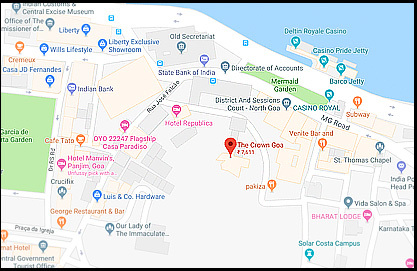 Its strategic central location provides easy access to all the local facilities, shopping areas, casinos, beaches and churches.Located on Jose Falcao road in a quaint street, The Crown Goa is surrounded by traditional houses.